In the peaceful land of Neutopia, an evil demon named Dirth sends an army of demons to ravage the land in one night, and captures Princess Aurora from out of the land's Sacred Shrine and holds her captive in the Climactic Castle and also steals the eight medallions from the Shrine as well, that where the ones who helped the people to live in prosperity and happiness, which he now controls for evil purposes as he scatters them around Neutopia's world being locked inside crypts. 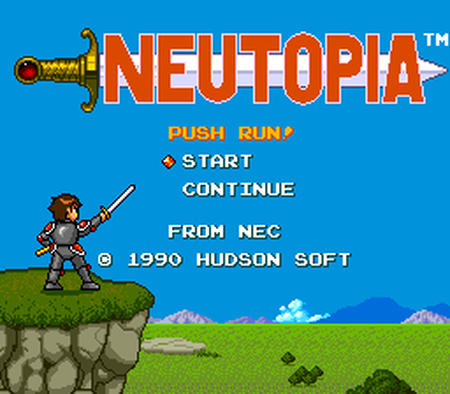 And now it is up to a young warrior named Jazeta to retrieve the medallions and save Princess Aurora from the evil demon Dirth before he conquers the world of Neutopia ! The story is pretty basic, it's pretty much the classic fantasy fairy tale of the brave warrior saving the princess from an evil villain, there are other NPCs that can give you some bit of a background to the world of Neutopia, and there's even some nicely spoken motivation as to why the villain is evil in the first place, and these make this story seem a little bit out of its basic nature, but other than that, it's not bad, but the story is something that you might have already heard from other fantasy games before. Neutopia is a zelda-style overhead action-adventure game. The whole objective of the game is to collect all of the medallions locked away inside a dungeon guarded by a designated boss that you must find and defeat and then destroy Dirth as you've collected them all. When I say that this was a zelda-style game, I really do mean it, since this game is pretty much similar to the top-down 2D zelda games, only this time with a bit of a difference when talking about gameplay. 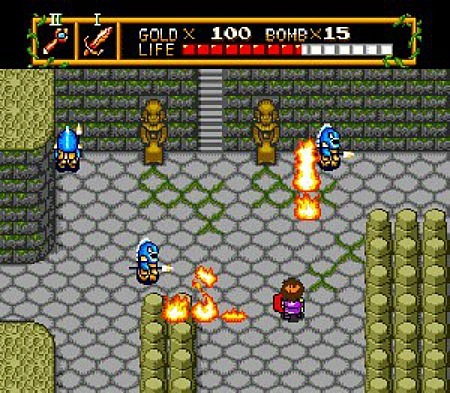 The controls are very similar to the 2D zelda games as well as you have a button for attacking and the other button for using an equipped item, as well as a button that can access your inventory, you first start out in the first overworld of the game where you can explore, this overworld includes many secret entrances that can be open by pushing a stone, burning a bush, blowing up a wall, etc. most of the secret rooms contain an NPC that can either tell you more about the story of the game or sometimes their opinion of the whole situation, an NPC that can sell you some items, an NPC that can restore or increase your health bar, etc. but there are also some enemies that you will encounter as well, as some of them can take one strike with a sword while some may take a lot depending on what overworld you are and which weapon you have equipped (more on that later...), there is some nice variety when it comes to the enemies, be it on how behave and how they look like and a few on how they attack, most of them just walk around but they might also chase you to be defeated as you can take damage by just touching them. Enemies also drop some items sometimes when you defeat them, be it some gold, a bomb or, very rarely, cherries that can act as a health item, and even the hourglass from the first legend of zelda game is there as well, in which it can temporally stop enemies from moving or attacking ! speaking of items, you also receive similar items such as a lantern that can illuminate dark rooms (but it doesn't act the same as the candle from the first zelda game) and a "rainbow drop" that acts like a little bridge that can make you cross small gaps. 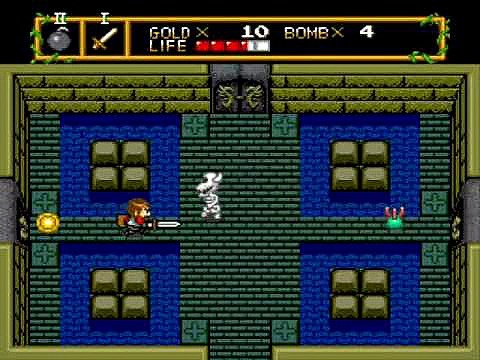 There is also a health bar that can be upgraded by finding a room in the overworld and completing a dungeon, you can also upgrade your armor (can make you take less damage from enemies), your shield (blocks projectiles) and sword (the only main weapon you use, aside from the fire rod) by finding them inside the dungeons, ranging from weakest to strongest the further you go into the game (or smaller to bigger in terms of the shield). These are some of the details that makes this game similar to the 2D zelda games, while the gameplay is fine, there is one big problem I have with it, it's hit detection, the character you control is more taller than link in the first zelda game, and this is troublesome since the game doesn't know how to handle it's perspective, and what I mean is that you can get hit by an enemy by just touching you as I've said before, and when it touches your head you can get hit... even if the enemy isn't in front of you, where you attack range is, and this is really annoying in the later overworlds as you might get hit some times if you're not very careful. But now here are some of the details that makes this game unique from the 2D zelda games, first is it's way of saving, you can save by entering the Sacred Shrine or to a cave that is near the main dungeons, and you can save by two ways, by saving in the game's memory in the "file Cabinet" or by, if optionally obtaining the "Book of Revival" item that can be found immediately near the start of the game, using a password system, continuing and restarting the game wherever you have last obtained the password, there's also the items that I've mentioned before that also have new unique ones such as a magic ring that can transform enemies into weaker ones and some wings that can take you to the nearest place where you last saved and received the password, one huge difference is that there aren't many "offensive" items such as a bow and arrow and a boomerang, aside from the bombs, the only offensive item you get is a fire rod, which is an overpowered version of the candle in the first zelda game, it basically acts as a sort-of medium range weapon that can also burn bushes to reveal secrets, and it's power strength can depend based on how much health you have, the more you have and the higher it is increased, the stronger it gets, it's pretty much the item you might use all the time in the game due to how practical and useful it is for enemies and discovering secret caves in bushes (and, in fact, it can actually attack diagonally as well... something that your sword can't do...), and one last thing is that you have a compass, which it can indicate you which dungeon to do by pointing the direction of where it is depending where you are, it might make this game less time consuming when searching for the next dungeon, but it doesn't shows you where it is in the map, meaning you might not know if you will find a blocked path towards where you want to go, even it the compass might indicate that it's on the other side of the blocked path, you have to take a long path to reach it since it doesn't show you how to get to it, just where it is. As for the dungeons, there are eight of them and there are two in each of the four overworlds: Land, Subterrain, Sea, and Sky, and each dungeon gets more complex and long later in the game since later on you will encounter trap blocks that hurt you if you get closer to them, enemy pit holes that respawn multiple enemies, and much more, you need to use certain items in the overworld to reach the dungeons and some items to make the dungeons a bit more easier to go through them (such as using a lantern to light up the room or using the fire rod to help you with some enemies), there are also secret passages and stairs that can take you to another room, either to make a shortcut or because it was inaccessible, and there's also some moments in the game where you will be trapped inside a room as the doors to the next rooms are locked and you need to either defeat all the enemies or push a certain block. Each dungeon, while having items to upgrade your equipment, also has its own map that you can completely reveal by getting the crystal ball hidden somewhere in one of the rooms (you also, with no need of a compass item or anything, have an indicator that shows you which room in the dungeon are you currently in), and there's also the key that is required to enter the dungeon's boss room, and once defeating the dungeon's boss, you will get access to another room where you can pick up the medallion. In terms of difficulty, it's pretty mixed since there's the bad hit detection from your character that makes the game hard while there's the fire rod and the compass that can make your game easy, but it is leaned towards the hard difficulty due to how often the bad hit detection issues are and what's worse is that there is barely any health that the enemy can drop, and the only way to completely heal yourself is by taking medicine, which you can carry two and costs money to buy more and gets expensive in the later overworlds (you can go back to the previous overworlds anytime to buy the cheapest ones but that takes time depending on how far you are), by visiting a certain NPC in a certain secret entrance in an area, or by the Sacred Shrine, the caves that are near the dungeons where you can save don't heal you, which is pretty annoying, and what's even worse is that once you are defeated you go back to the caves where you last saved or visited, but all of the gold you had will be reduced in half and your health isn't even replenished up to a half of it ! Aside from the similarities to The Legend of Zelda for the NES, this game is pretty unique and nice when it comes to how to save and some of its helpful assets is offers such as the compass and the fire rod, and how there's variety in exploring the world since there's different overworlds to explore instead of just one, but it's annoying hit detection that makes this game annoyingly hard and it's lack of more health items in the field when you defeat enemies doesn't help either, it can be a decently-challenging game if you can get used to the hit detection, but for me it was too annoying to get used to. This game is pretty colorful and full of variety when it comes to its choice of graphics, the game is sort of simple with chibi-style characters (although... the design for the main character Jazeta looks pretty awkward, as I think he looks like he's fat and his way of holding his shield is inconsistent when looking at his sides and attacking) and a simple patterned design in the water, land and walls, but there's also some assets placed in each area such as rocks, stairs, designs that might indicate a hidden cave or not, etc. 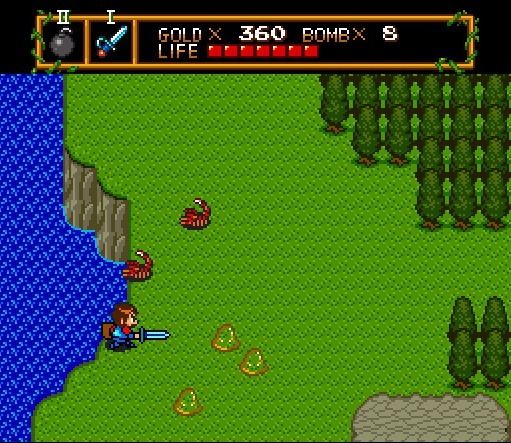 that makes it much more varied and unique as you explore, and there's even more variety when entering the other overworlds since the graphics represent the setting you are on, such as a water ruins-focused design land in the Sea overworld and such, and there's also a lot of variety in the enemy designs in each overworld as well, and the dungeons also have a different color, different enemy design and different asset placement such as stones and water pits in each of them as well as a unique boss design, the game does a great job at having something unique and much more varied in its design and it's not pretty bad to look at, anyone appreciating a lot of colors in their game can appreciate this game as well. The soundtrack is simple, but not that bad, it sounds like it came from an 8-bit console but with a little mix of a 16-bit console music, the songs don't have much to offer since they're way to simple that you end up not noticing them, with the exception of the final boss music since it's more than decent to hear, and maybe the dungeon music as well, since it's always the same song in every dungeon, all of the songs are nice to hear, but it's not something I call memorably good, just decent. As I've said before, there is some great variety in terms of overworlds and enemies, for the friendly NPC's not so much, but this game truly has a unique world to explore, as the Land overworld has a green land but also has a river, a forest like environment and a higher ground to climb up to with the stairs and the Subterrain overworld pretty much has an lava world-like environment with cave spires and lava streams, and there's even a few areas that make up for the variety of the overworlds such as a little dessert area in the Land overworld where it's mostly green pastures and forests, not so much on the dungeons however since they all change the color of the walls, but they do have more variety included later on such as the traps and some few details such as a pool and some sand floor as I've mentioned before, and there is a lot of enemies included as well, there's many types of design in them in each overworld but most of the time some of them behave the same in how they attack you, but others do have a new way of attacking you like some enemies can throw spears and some critter-like creatures can jump higher. As for the replayability, there really isn't much to do since collecting health upgrades for your health bar might be part of an optional replay value, but it is pretty necessary as the game is difficult so it might not count, that is if you want to challenge yourself by not collecting them (good luck with that...), and there really isn't anything to collect, but you can discover all of the secrets caves in the overworld and secret passages in the dungeons in the game that you might have missed, but other than that, the game is pretty simple on its replay value but it is lengthy on its own. What happened to the last 3 posts? They disappeared. My thoughts are that the review was a little harsh, but overall it was a great review. Are you going to review the superior Neutopia II at some point? My comment was one of those messages. Beautiful review Jnes5 I think your score is perfect for this game! Is this game worth the $6 it costs for fans of adventure games? @Golden_Toad wrote: Is this game worth the $6 it costs for fans of adventure games? Yes it is, it's not quite as good as Zelda, but it's still a fun game. Hudson did a good job developing this game, I personally like this game more than The Legend of Zelda for the Nes! Very fun game review is nice. The review is the most amazing one I've seen in a long time! Kudos to you Jnes5! That's quite a review man you did a very good job! Also thanks for the feedback guys and gals ! Welcome back Jnes5! Amazing review man! We look forward to your return #Jnes5. Nice review btw. I played the original and rather liked it back then. It was definitely the Turbos answer to Zelda at the time. I never thought the controls were bad back then but I'm not sure how well it translated to the Wii. Either way I'm not sure I could even get into this again as I'm sure it would feel quite dated by today's standards. Great review though and looking forward to the review of the second one as I never did play that one. @Tech101 wrote: I played the original and rather liked it back then. It was definitely the Turbos answer to Zelda at the time. I never thought the controls were bad back then but I'm not sure how well it translated to the Wii. Either way I'm not sure I could even get into this again as I'm sure it would feel quite dated by today's standards. Great review though and looking forward to the review of the second one as I never did play that one. Oh wow, I didn't realize how old this was. Somebody's been digging lol! Thanks for the heads up. Figured it was new as things like this usually get buried forever. @Tech101 wrote: Oh wow, I didn't realize how old this was. Somebody's been digging lol! Thanks for the heads up. Figured it was new as things like this usually get buried forever. Nope, reviews get necroposted from time-to-time.